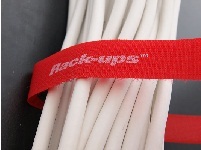 Rack-ups™ "Your solution for moves, adds and changes"
Rack-ups cable management straps evolved from our CORD LOX®. 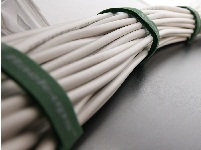 line of cable ties. 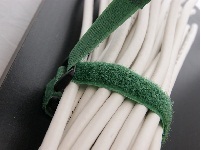 In the early stages of the Dot-Com craze and subsequent build out of the fiber optic network, a solution for bundling delicate fiber optic cables, especially Cat 5 at the time, was needed. 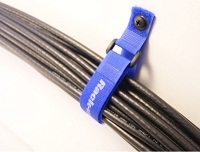 Bardsco along with its parent TFI, developed these cable ties to address the over tightening or cinching issue of these delicate and expensive cables. 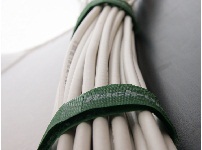 Problems arose from the over tightening of the plastic cable ties, which would lead to the attenuation of the light within the fiber optic cable, distorting the signal. 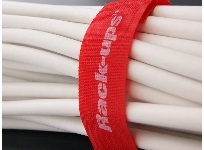 Hundreds of thousands of these products are in Data Centers, computer closets and broadcast facilities throughout the world. 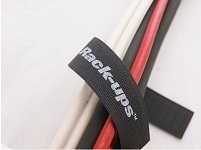 The Rack-ups cable management series offers four models; The BG- Buckle Grommet, EG -End Grommet, CG Center Grommet and the N model. 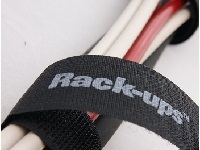 Like the CORD LOX®, other uses have evolved for Rack-ups. 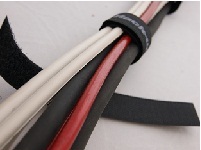 Industrial furniture manufacturers use these products to manage cable under, in and around the products they build for such companies as Nike and Boeing. 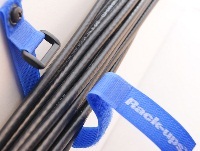 The furniture in most 911 call centers in municipalities all over the United States have Rack-ups installed. 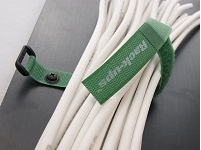 The BG series is great for attaching cables to communications equipment racks. 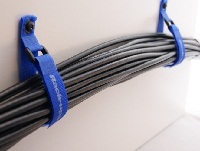 A Popular choice for horizontal cable runs. 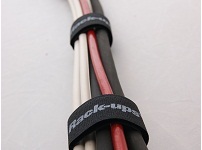 204-BG 3/4" x 4" 206-BG 3/4" x 6"
209-BG 3/4" x 9" 212-BG 3/4" x 12"
The N series has no grommets or buckles, and is perfect for simply bundling up cables, making it easy to add or remove cords. 204-N 3/4" x 4" 206-N 3/4" x 6"
209-N 3/4" x 9" 212-N 3/4" x 12"
Sound and video professionals use the CG series to organize their portable rack-mounted gear. Grommett is placed in the center of the strap. 204-CG 3/4" x 4" 206-CG 3/4" x 6"
209-CG 3/4" x 9" 212-CG 3/4" x 12"
The EG series is the choice for shelves or walls and ceilings. 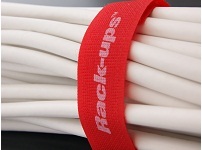 Vertical cable runs are now more manageable. 204-EG 3/4" x 4" 206-EG 3/4" x 6"
209-EG 3/4" x 9" 212-EG 3/4" x 12"
Rack-ups can be built to your specs and printed with any logo or message you prefer.